A beautiful hi resolution image of Auchinraith House at Blantyre, photographed in 1870 by Thomas Annan. The charming mansion was a medium sized country house of two storeys with a classical portico to declare it’s importance. 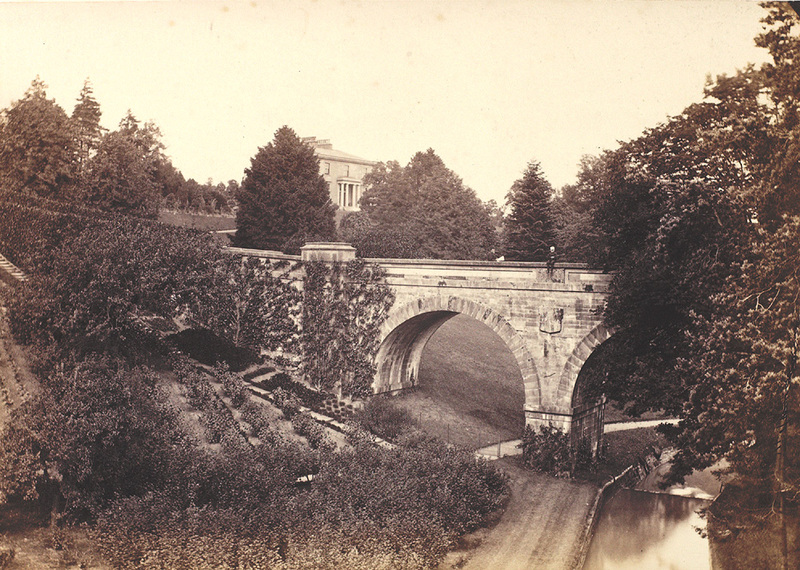 Designed by architect David Hamilton and built in 1809 to replace an older one, known as Whistleberry or the Grove, on the other side of Park Burn, at the bottom right of the photograph. It was no doubt an imposing house. The Coulters, a well-known Glasgow family, had lived at Auchinraith during the 18th century. John Coulter was a West Indies merchant and Lord Provost of Glasgow in 1736. Lowrie Coulter was famously caricatured by Kay in 1793 and described by J F S Gordon as the (self-proclaimed) “wisest man in Glasgow.” Later it was owned by Captain William Lockhart, MP for Lanarkshire, who was not simply a man who held high regard for his position, but was also apparently a man of money and taste. It was him, along with David Hamilton, the foremost architect of the day who designed the elegant house. Indeed, such was Hamilton’s esteem and fame for doing this, he was later commissioned to work at Hamilton Palace. Auchinraith was acquired in 1831 by Robert Douglas Alston, an insurance broker and an officer in the “Glasgow Volunteer Sharpshooters” at the time of the “Radical Rising” of 1820. It was subsequently acquired by Alexander Glasgow, a retired merchant; by another Glaswegian, Robert Ker and (in 1877) by George Lamb. It is perhaps worth noting that in 1846, Auchinraith was purchased by Alexander Glasgow for £12,000 and was sold for the same sum in 1852 to Robert Kerr. However, with the discovery of coal in the area and to give some idea of rising property values, Mr Kerr received £45,000 in 1877 when sold. That’s the equivalent today of buying a property at £1million and selling it for £5million!! A nice little earner, as they say. Auchinraith was then earned by the Russell family, important coal mine owners in the area. It was then later used for educational purposes before being demolished, reputedly in the mid 1930’s.